The Corridor of Discernity: KP, cricketing romantic or 99 flake? KP, cricketing romantic or 99 flake? England should be well satisfied with their First Test performance. Satisfaction in this case being measured in terms of banana skin avoidance. The only real comedy slip up came from perhaps an expected quarter. Kevin Pietersen. Putting aside the bland, banal statements of the obvious - that his innings was a welcome return to form, proof that not much is wrong etc.,etc., his first innings dismissal was fascinating. If you had been told in advance that he would be dismissed by a spinner on 99 then, with the best will in the world, visions of a huge premeditated slog-sweep/reverse swipe would have come to mind. This would have led to a large, and similarly premeditated, castigation of his irresponsible, self-absorbed, ego-maniacal persona. Prejudice confirmed and satisfied. So attempting a sort of dainty nurdle down to third man for an ambled single was not really what was expected. Or wanted. In fact it has really rather added to his very particular mystique. If it weren't for that fact that it was a left arm spinner then one would be left thinking we didn't know him at all. In his own words he admitted "Funny things happen to cricketers all over the world on 99". Of course this is true but, as I'm sure he'd agree, this isn't just any cricketer we are talking about. This is one of the most talented players the world has seen in the last twenty years and the most talented England player since David Gower. Even more to a point, this is a cricketer who wants to be a great cricketer. So I'm afraid that 'funny things happen on 99' just doesn't cut it KP. What were you thinking? I want to know. One possibility is that he was so determined not to provide extra fodder for his critics that he determined that under no circumstances was he going to play the big shot. But I'm not convinced. It has a rather disappointing 'batting by numbers' feel to it and I would like to give him greater credit than that, even at the risk of continuing the mystery. My preferred theory, which has the added bonus of taking his ego-maniacal rating into Kanye West territory, is that he consciously, okay subconsciously, allowed himself to be dismissed, considering that a hundred against Bangladesh was not a true Test hundred. There are precedents for cricketers denying themselves such landmarks. Mark Taylor famously declared on himself on 334 not out, leaving him tied with Bradman as, the then, highest score by an Australian in Test cricket. Less well-known was Gary Yates, the ex-Lancashire off-spinner's refusal to go to three figures in the face of some top quality Glamorgan declaration bowling, leaving it instead for his partner Glenn Chapple, who apparently suffered from no such elevated morals, to set a then world record 27-ball hundred in 1993. Okay it's a bit of a flight of fancy, but what if there was more evidence? Fortunately, KP doesn't just let his batting do the talking and is usually good for a couple of memorable quotes on which to base some in depth psychoanalysis. This week was no exception. Yesterday he announced that Test cricket is 'not a game for girls' and followed it up today with a pronouncement that he was a 'huge, huge, fan of Test cricket' (as Derek Pringle pointed out in The Telegraph, he never does anything by halves). If we put this information into the 'bat computer' then, aside from establishing that he probably doesn't like girls' games, it may just add credence to my theory. The 'hugeness' of his of love of Test cricket suggests someone quite prepared to sacrifice a personal goal for the good of the game. The 'not a game for girls' quote though is even more intriguing and may reveal an astonishing truth. 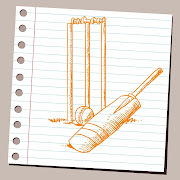 Test cricket is complex, unpredictable and can go on for days. And what's more, men have been trying to work it out for centuries.... Think about it. What if Pietersen, was trying to tell us something? Test cricket is not a game for girls because.... it is in fact a girl itself. If so, his sacrificial dismissal was in fact his latest attempt to woo her, to prise her out of little Sachin's arms and into his all enveloping, slightly tattooed, embrace. How about that? I wonder if Freud liked cricket?